Do you wanna be in my club? Casino Club, the new hotspot in town? 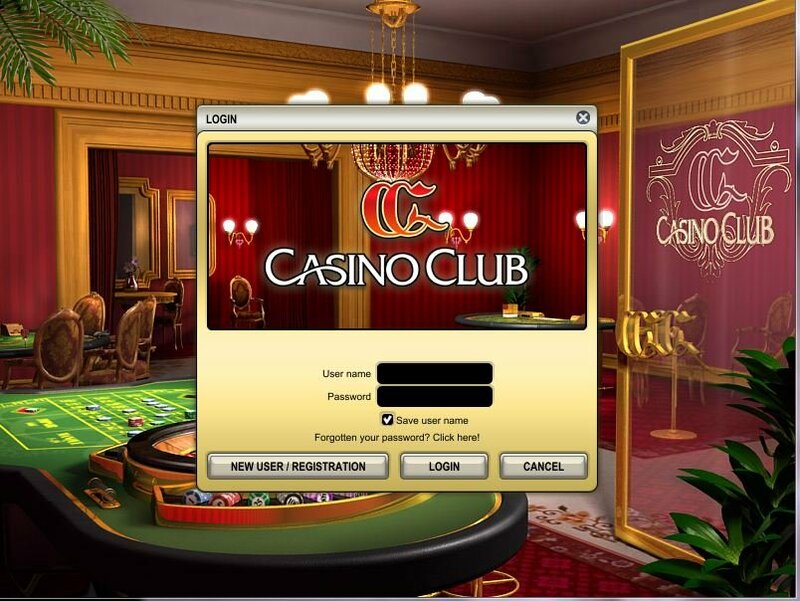 Casino Club is old school and has been going since 2001. Primarily aimed at German players, they are licensed by the LGA (Lotteries and Gaming Authority) in Malta and runs on Gtech G2 (formerly Boss Media ) software. 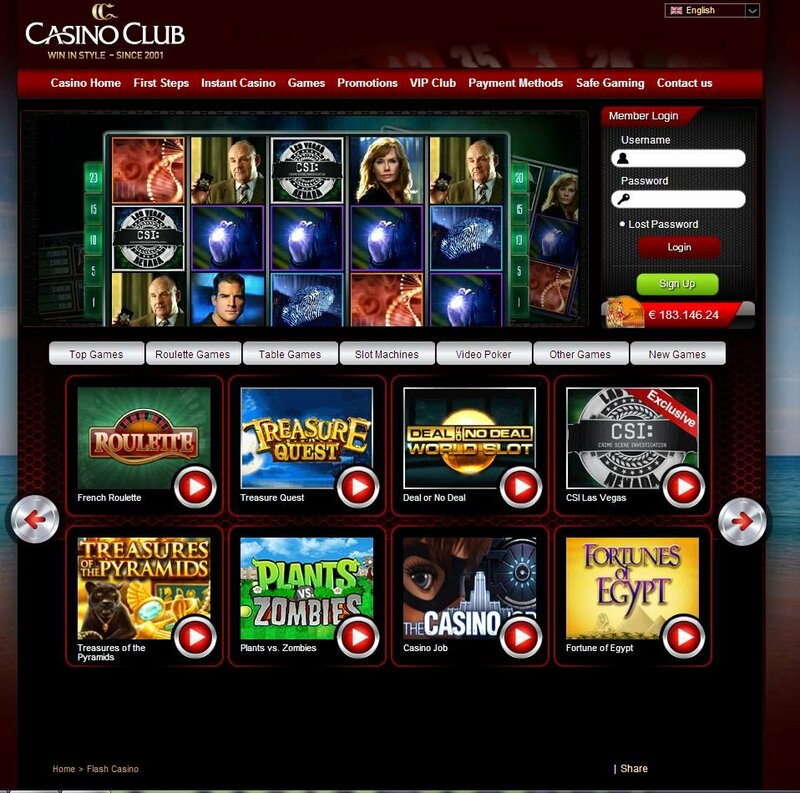 Casino Club Download or Instant Play? Dowloading Casino Club takes rather a while, in the meantime, I checked out the instant play option and, once I had made sure to update my Flash (I could swear I did that recently; where does the time go?!) I was ready to start playing whilst the casino continued its slow progressing download. Just when I thought download had finished and I was able to choose my language, it tells me I have to decide which one of four types of games to download: slots, roulette, blackjack, or another one. Then it tells me the remaining three are available to download once this new download has finished! I am beginning to see why Casino Club offers an instant play version! 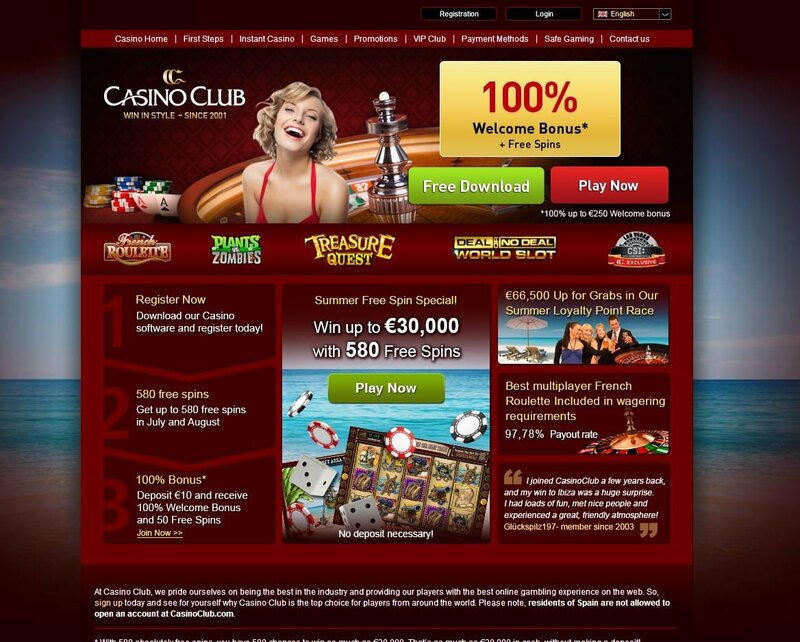 Receive up to €200 in an 100% welcome bonus opportunity with plenty of different monthly titbits to in incentivise you., such as free spins on certain games or free raffle tickets. There are also huge cash prizes up for grabs and 5 star trips to exotic Morocco (currently available for July). There's a happy hour bonus of up to €120 as 30% of your deposit on Sundays and Thursdays for your gaming pleasure. Wednesdays aren't left out either though as you can get a €50 bonus then too with a 1 in 10 chance. How's the Service in Casino Club? English, German, French and Dutch are at your service between 8am and 1am via Freephone telephone numbers, email and live chat. As a predominantly German based casino, the English you will be supported in is of a low standard and seemingly, helpful customer service means something different to Casino Club. Unfortunately, bearing in mind different time-zones and not being available to its customers 24/7, those of us who like a gamble after midnight or when we can't drop off to sleep at night, will be unlikely to receive even a modicum of a response. There are also huge cash prizes up for grabs and 5 star trips to exotic Morocco (currently available for July). Gtech G2 is a good gaming software choice for a platform and Casino Club slot game machines are cute and cheerful with lots of big winning opportunities. There is a top ten list so you can see the favourites amongst all the players, such as Fortunes of Egypt, Crazy Wizard and, my personal favourite that I just can't get enough of:- Deal or No Deal slot game. You've got your classic slot games plus a batch of historical slot games like Roman Empire (those dudes us Brits can thank for our perfectly straight roads) and Age of Vikings (you know, the ones with the cool headgear that had some sort of tusk like instruments sprouting from them).